As with other aspects of video games, the music used in them has become much more complex and intricate. Game music has also become more generally mainstream. I’ve been to pretty packed concerts of both Zelda and Final Fantasy music performed by orchestras. Growing up when I did in the NES era, it’s the music from around then that really sticks with me. Most of the tunes are quite short, constantly looping as the game goes on. With the NES, you could only use three instruments, and two of them had to be the same. There wasn’t a whole lot of memory you could devote to music, either. They could also be insanely catchy, and the music from the early Super Mario Bros. games definitely qualifies here. The composer behind this was Koji Kondo, who also scored the early Zelda games. He’s said that the music is generally meant to convey the setting you’re in, and what to expect in a particular level. The original Super Mario Bros. theme is iconic, and I’ve seen that it took longer for Kondo to write it than the other melodies in the game. While not really something I consciously notice, it was specifically written so that the action and sound effects would occur in time to it. I understand that his first attempt at the theme was slower and more relaxed, and he gradually changed it to fit the driving, exciting feel of the gameplay. Apparently Kondo didn’t really think about what genre the theme would be, but he later recognized it as sort of a Latin/jazz kind of thing. Nintendo was known to have endorsed a specific set of Japanese lyrics for it, submitted by listeners to a radio station back in 1985. These words really drive home that Mario is full of energy, which I suppose is true. I mean, he doesn’t need to stop in the middle of a level to take a nap. 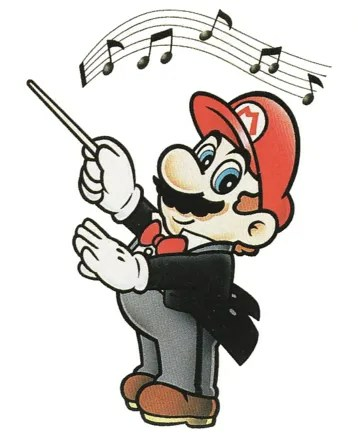 In the Super Mario Bros. Super Show, there were two different raps to the theme, as well as Captain Lou Albano singing “Do the Mario” to the tune during the closing credits. A version of it is used in SMB2 for subspace, and there’s a steel drum take on it if you stay long enough on the map screen for the Special World in Super Mario World. I didn’t actually realize until fairly recently that the music box tune in SMB3 is also the same tune rearranged into a lullaby, probably because nobody in my family used that item very much. I’m somewhat fascinated by how the same tunes can be successfully repurposed in later games. The story at the beginning of SMB2 uses the underwater music from the original SMB, but more up-tempo and with a defined ending. SMB3 reuses the underground theme from SMB1, but with bass and percussion added. That’s a rather foreboding piece of music as it is, and something I wouldn’t have noticed but that’s apparently true is that the SMB1 version switches between 4/4 and 3/4 time. I do sometimes find myself thinking that the one part of it has too many notes in rapid succession. And the ending theme for SMW is pretty similar to the SMB2 overworld theme, although I don’t think it’s exactly the same. The Super Show cartoons did quite a few different mixes of the music from the first two games, often arranged to fit the theme of the episode, as well as a few pieces that weren’t from the games but still fit in pretty well. These two compilations include a few of the rearranged and original compositions. Kondo has said that the music for SMB3 was largely reggae-based, and that because it tended to be slower, it didn’t match the gameplay as well. I’m not generally a reggae fan, but I can hear some influence in SMB3, particularly in the slower overworld theme and the Water Land map music. The battle themes for bosses and Hammer Bros. both sound rather stressful. I came across a good overview of the music for the game. I feel the guy who wrote it is too harsh on other games, particular SMW, but he’s right that SMB3 feels epic. The fact that each world has a map screen with its own theme music definitely helps. The Grass Land music might be the most memorable from the game, and it is the first thing you hear when you begin playing. I know it’s appeared in other games as well, such as in the opening to Super Mario RPG. It’s actually my current ringtone, which has no bearing on anything, but I felt I should mention it. Not all of the map music is equal in quality, but it mostly fits the feel of each environment. The exception is Giant Land, which is a good theme, but doesn’t really seem to have anything to do with gigantic enemies and landscape. The ground music from Sky World actually seems like it would be more appropriate for that. The Ice World music sounds kind of treacherous, and I’m not surprised it was sometimes used in the SMB3 cartoon for when bad things were happening, even when they weren’t ice-related. I think the World 2 music is the most repetitive, taking the shortest amount of time before it loops, but it’s still quite evocative. There’s not a whole lot to the Dark Land theme either, and it sounds a lot like the beginning of the airship theme anyway. I believe both of those have actually been confirmed to be at least somewhat based on the Mars part of Gustav Holst’s The Planets. While the Super NES could handle more complex music, it does seem like SMW lacks the variety of SMB3’s score. Most of the in-world themes use the same tune, although they’re arranged differently. For that matter, it seems to be at least partially based on the original SMB theme. Also, three of the seven worlds use the same music on their map screens. It’s also generally less awe-inspiring and more twee , perhaps foreshadowing the direction later games featuring Yoshi would take. Well, maybe not so much in the Valley of Bowser, where it sounds like some sort of Halloween dance party. The most noticeable aspect of SMW’s music might be how a drum track is added whenever you’re riding Yoshi. As of late, I find myself drawn to the overworld music from Super Mario 3D World, a game I haven’t played. I know Kondo was somewhat involved with the music for it, but didn’t write all of it himself. 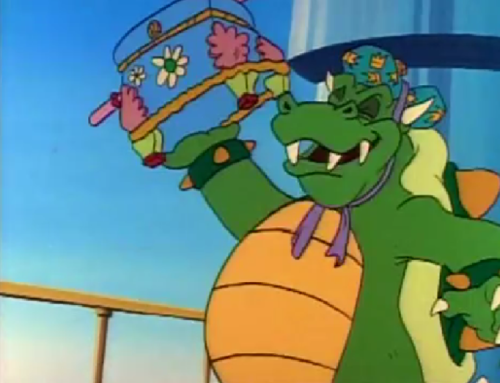 This entry was posted in Cartoons, Mario, Music, Super Mario Bros. Super Show, Television, Video Games and tagged captain lou albano, do the mario, gustav holst, koji kondo, super mario 3d world, super mario bros., super mario bros. 2, super mario bros. 3, super mario rpg, super mario world, yoshi. Bookmark the permalink.